Parabellum’s BMW F800R Sport Shield is designed to offer good upper body and head protection for this adventure type motorcycle. 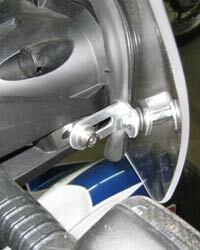 The shield is manufactured from 3/16 inch, military grade, cast acrylic for optimum clarity. It is 19.5 inches wide at the widest point and easily mounts to the handlebar clamps and to the sides of the headlight. 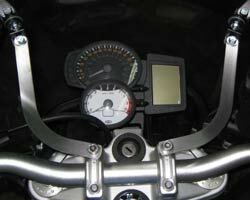 It is offered in three different sizes to accommodate riders of various heights and is also available in clear or tint. I took off the Wunderlich Ergo windshield. The wind noise was high, especially the noise I heard in my helmet (without ear plugs). I sheared the windshield in half with a grinder and it got no better. I put back the original tiny wind deflector and that just brought noise and the mass of oncoming air on my chest. Then I ordered the Parabellum tall 26" windshield. 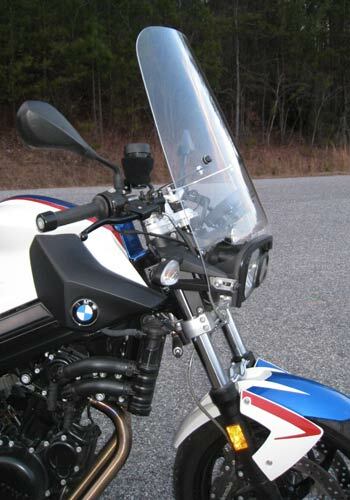 I took a chance ordering the tall windshield, as I put a Corbin seat on the F800R and that brought me much higher than the original uncomfortable low seat. I am 5'9" and I just can see over the top of the windshield or simply choose to duck below it. 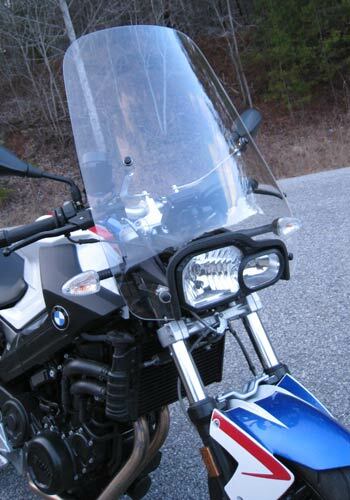 Let me tell you that the Parabellum windshield works superbly and does protect you from the wind with very little or almost no noise, wearing my HJC CL17 full face helmet at 60 to 70 mph. I will try it with other helmet types I have but expect the same great wind protection and quietness.